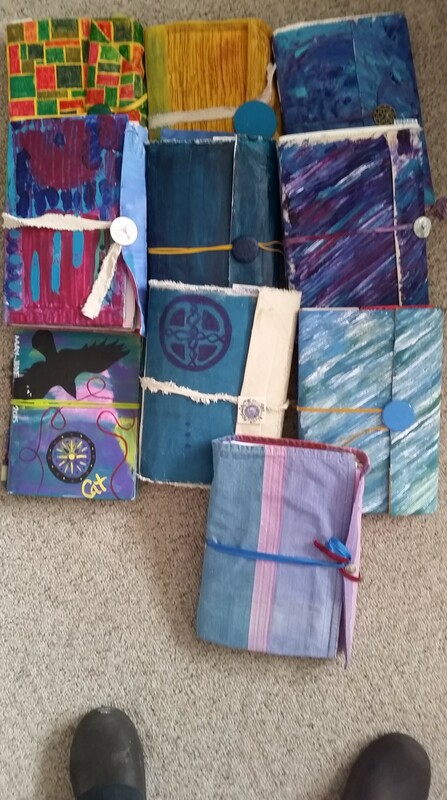 I also, surprisingly, filled these 10 journals with musings, lists, doodles, paintings, collage, print outs of memorable emails I sent or received, photos of my paintings and writings throughout the year, and an article or two I just couldn’t throw away. As you can see, I make my own journals, sewing folded watercolor paper into fabric covers. There’s one Cosmic Smashbook in there: the one with the raven and compass painted on the cover is a decorated composition book. It’s perception I want to talk about right now, though. As I was in the midst of living all this, it felt as though I wasn’t getting nearly as much done as I had hoped. It felt as though I’d never get the courses finished in time; it felt as though I might not have time to adequately prepare for my own offerings. Yet each day I just moved forward as best I could, more slowly or not at all on the bad days when the physical pain claimed all energy and attention, joyfully and exuberantly on the internal sunny days. If I hadn’t created some kind of documentation of my days, if my courses had not each demanded the submission of my cumulative body of work, I would probably still be feeling as though I hadn’t gotten enough done last year. And how crazy would that have been, faced with the evidence of what actually filled the days of 2015!!! The thing is, I’m not the only woman I know who fills her days with necessary and worthy activities — I’m just lucky enough, or conscious enough, to have paused to collect, photograph, list, and reflect on what filled those days. And that’s what I’d encourage you to do. Take a weekend or a day to go through last year’s calendar; reread whatever journals you kept; remember the emotional, physical, spiritual challenges. Give yourself credit for the beautiful life that you are creating for yourself and your beloveds. Believe it or not, but most of my friends “do” a lot more than I do. But look at what accumulates in just a few hours a day, day after day after day! Remember Mary Oliver’s question: “Tell me, what is it you plan to do with your one wild and precious life?” And I’ll add: Tell me, who are you? Who do you want to be? p.s. I’ve taken it easy this month, doing some wrap up of 2015 and planning for the coming months. My intention is to follow the moon’s energy a little more closely this year, and to write two blog posts per month, one on or near the Full Moon and one on or near the New Moon. Thank you for being one of my readers. I’m honored that you’re here.